The lights of a Christmas tree always bring a beautiful ambience to the special time of celebrating the Gift of God, the Light of the world. Having seen a post on setting up a unique portrait, I implemented a few of the suggestions to add a little more magic to this shot of my granddaughters. By placing my cell phone (with video) playing, two things were accomplished: 1) glowing light emanating from the book and 2) the video maintained the focus of the kids on the book. My wife prefers non-blinking, white lights and that has been standard on our trees since marriage. However, my daughter’s tree had LED lights that changed from white to colors and blinked every 3-5 seconds in the various transitions. The sight brought back a forgotten childhood memory of laying on my back and watching the changing colored shadows that the blinking lights on the tree created on the ceiling of our living room. To me, it was the ambience that bred a sense of anticipation, excitement and joy. Hello Winter. Today is the winter solstice. While December 21 marks the shortest amount of daylight of the year in North America, the coldest temps are yet to come. MSN.com had this explanation for the lag in the shortness of daylight and colder temperatures. The solstice marks the astronomical beginning of winter, while meteorologists view winter (the three coldest months) as starting Dec. 1. The day of the solstice, however, isn’t typically the coldest day of the year. There is a weeks-long lag between the solstice and the coldest average temperature for most spots in the USA. This lag in temperature occurs because even though the amount of daylight continues to increase, the Earth’s surface continues to lose more heat than it receives from the sun. In most locations across the country, the coldest weather occurs around two or three weeks later, in early to mid-January. Photography in the winter elements can be challenging, but also tremendously rewarding. From the crisp blue skies to the beautiful sunrises and sunsets, it is definitely worth getting outside for some shots. However, for the faint of heart great captures can be taken from the warmth of car. I hope to add some fun winter shots in the next three months and look forward to seeing yours, too. *Today also marks the changing of my header, a rural road in Union County, Iowa, that I change with each season. It seemed appropriate to turn on the WordPress snow machine, too, but it will stop on January 4. It was shaping up to be a stress-free Christmas. For the first time ever, my wife, Myra, had prepared most of the Christmas dinner and fix-in’s ahead, so it would just be a matter of warming things up on Christmas day. All the shopping was finished and presents were wrapped. My parents were spending the holidays with us (a rare treat). It looked like we were going to have a wonderful Christmas celebration on Wednesday, December 25, 1991. However, our youngest daughter got sick on the way to her piano recital on the previous Saturday and by that evening, she was showing classic symptoms of appendicitis. I took her to the hospital emergency room and after several tests, she was diagnosed with a urinary tract infection. I stopped at the all-night Walgreens on Park and S Highland on the way home and immediately got her started on the antibiotics. The next morning while I was at church with the other girls, Myra said that Laura had some excruciating pain and then it subsided. She continued to be lethargic, however, and worsened the next day. A call to the nurse at our pediatrician resulted in an encouragement to be patient and let the antibiotics work. On Tuesday, Christmas Eve, Laura did not move off the couch. She had no appetite and no energy. My brother-in-law, an ER doctor in Little Rock, called that evening to check on her. He insisted that we return immediately to the hospital. Fortunately, my parents were there to care for the older girls while Myra and I bundled up Laura and headed to Baptist East Hospital in Memphis. A pediatric surgeon was at the hospital that night and informed us that we had a “very sick little girl” whose appendix had likely ruptured (on Sunday morning), and she needed immediate surgery. Of course, we consented and at 11 p.m. on Christmas Eve, she went into surgery. The appendix had ruptured, necessitating a longer than normal surgery. However, by 4 a.m. on Christmas morning she was in a room, and I went home to play “Santa” to the older girls. We opened presents. Then, with homemade sweet rolls already made, we had our traditional Christmas breakfast. My mother was given instructions on all the dishes to warm up for dinner, and the girls and I took Laura’s presents to the hospital for her to open. It didn’t take us long to realize that in God’s providence, He had helped even this stressful time to be a little less chaotic as the Christmas meals were prepared, presents wrapped, my parents presence to take care of our other daughters and the pediatric surgeon ready to go. Most importantly, my brother-in-law’s phone call on Christmas Eve may have saved our precious little eight year old’s life. 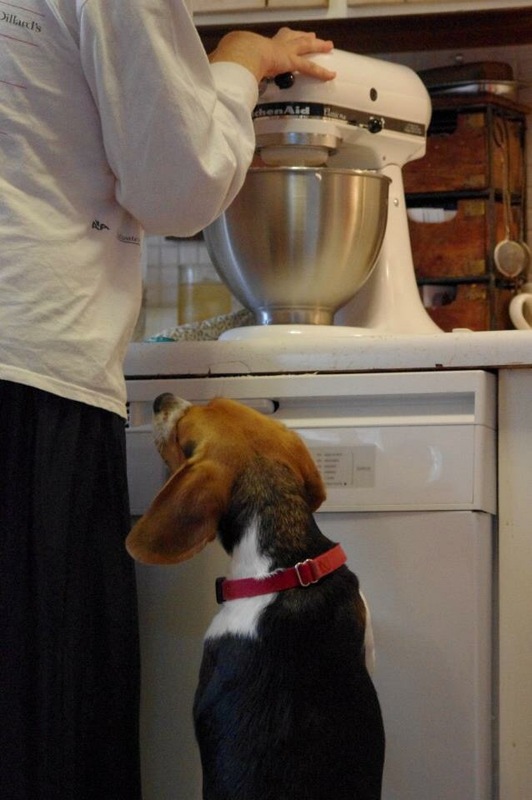 Dogs just seem to know when they should be prepared for any morsel of food. Hope you enjoy a good read of my daughter’s post today…also a WordPress blogger at Anna Spindler Writes. This picture best represents my desire keep pedaling my recumbent trike up a challenging hill on a bike path to a nearby state park, moving past that horizon and on to some additional “bike friendly” locations in the New Year. When cycling up a hill, it’s always a treat to see what’s over the horizon. This “horizon” shot was taken during a fall ride with my daughter while on vacation in Florida. Finally, a fun encounter with a galloping “woolly bear” worm while cycling around Green Valley State Park. I can’t imagine his perspective of me as I appeared on his horizon…but I brake at woolly bear worm crossings. This post is in response to the WordPress Weekly Photo Challenge: Horizon. Even a squirrel needs to relax after a morning of collecting nuts! As Advent begins tomorrow, I was setting up my personal crèche to use as an object lesson with the children during the worship service. Starting out with only the animals and an empty manger, I plan to add figurines each week until the Christ child is added on Christmas morning. As I unpacked the nativity set, I thought of Dennis. He was a youth in my first church, who gave us the nativity set nearly 30 years ago. I think of him every Christmas as I break the crèche out of the box. Dennis had experienced a hard life by the time he came to our church at the invitation of classmates. Both of his parents had died, and he was being raised by an older sister. Short, ruddy, quiet but quick witted, Dennis quickly endeared himself to us. After a summer youth trip to Branson in which he stabbed another youth in the leg (the truth of how that happened never came out), we had a “come to Jesus talk” and he actually did come to Jesus, that is. Along with the other youth, Dennis spent a lot of time in our home. He was included in a number of our celebrations, with him supplying the giant cookie from the Great American Cookies store where he worked in the mall. One Christmas he gave us the Fontanini nativity set and he added other figurines over the next few years. I moved to another church staff position in Memphis and then to Iowa, and we lost touch. I tried tracking him down through the internet and eventually found a newspaper article, touting his success in producing organic vegetables and selling them at farmers markets in Memphis. I actually emailed the business he operated, but never heard from him. Today, my thoughts about this youth, who by now would be about 50, caused me to do a Facebook search again, and I found him. However, I quickly discovered the posts were not by him but about him. Shortly, I reached a post that expressed sorrow for his sudden death on February 15, 2012. The news was like a punch in the gut. I quickly messaged another of the “youth” from that church, who coincidentally just “friended” me on Facebook. He shared that Dennis had a heart attack and died…and “sorry, thought someone told you.” I know that I could not have prevented his death by staying in touch, but I wish that Dennis had known how I remembered his kindness every time I’ve unpacked the nativity set he gave us so long ago. Tomorrow is the first Sunday of Advent. We will be lighting the Hope candle, as it represents the hope the people of God had for the long awaited Messiah. Foreshadowed through the curse of the serpent in Genesis 3, promised in the Abrahamic covenant (Genesis 15), and prophesied in many other Old Testament passages (Micah 5:2-3, Numbers 24:17, Isaiah 9:6), God’s people were hopeful. They longed for good news to the afflicted, comfort for the brokenhearted, the proclamation of liberty to the captives, and freedom for the imprisoned (Isaiah 61:1). And they were certain that God would fulfill His promises as He had time and time, again. With every Advent season and every communion we are reminded of the hope that we have in Christ Jesus. The Messiah came to fulfill all that God had promised and there are still promises to be fulfilled. As a lamb led to slaughter, who did not protest (Isaiah 53:7), Jesus willingly took upon Himself my sin and suffered my death, enabling me to have eternal life with Him. He continues to give hope to all who know Him as He is coming again to receive us unto Himself. And for that, I am eternally grateful for the light of hope shines upon me. And so, it’s not that time of the year without remembering Dennis. But knowing that Dennis and I had that “come to Jesus” talk gives me the hope that I will see him again one day…the very HOPE that causes us to celebrate the first Sunday of Advent tomorrow.